During the 1980's in the U.S., alternative music continued to be a strong voice of protest against President Ronald Reagan and his policies. 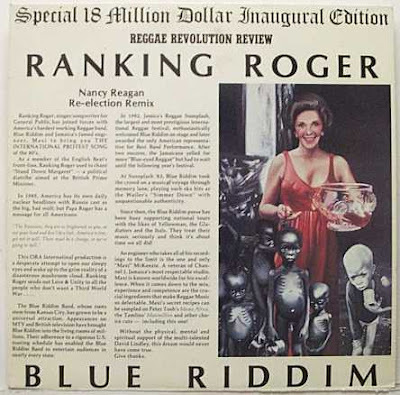 Perhaps the catchiest song to poke fun of the Reagan's came from the Blue Riddim Band, an American reggae band, who wrote and recorded the satirical track 'Nancy Reagan' about the President's wife. 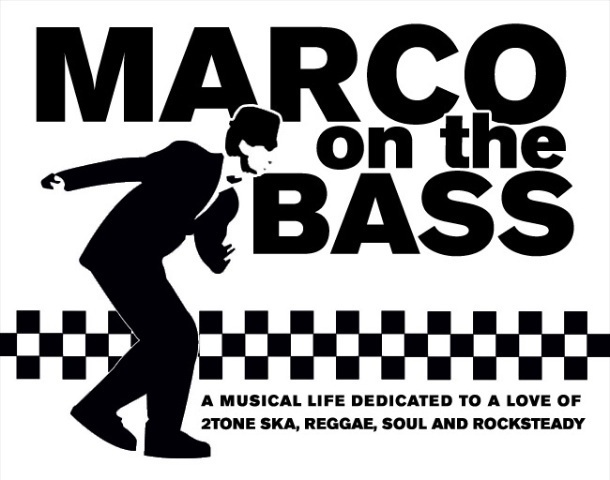 With brilliant lyrics including, "All my clothes are from the best designers/All my china is a perfect match', the song is a fantastic piece of Studio One inspired bass, drums and brass that may be one of the most overlooked reggae rhythms ever recorded. It used humor to make a cutting political statement about where the First Lady's (and our country's) misguided priorities lay during the 1980's. So what did the band think of the final product? I had always assumed that the band had collaborated directly with Ranking Roger. Apparently that was not the case. I recently connected with Todd " Bebop " Burd who joined Blue Riddim on bass in 1983, about the collaboration with Ranking Roger on the remix of 'Nancy Reagan'. According to Burd, "'Nancy Reagan' was originally recorded at Channel One in Jamaica in 1982 while the band was on the island to perform at Reggae Sunsplash and was released on our label as an EP along with five other songs." I think another strength of the group was the way they arranged the Jamaican originals. Check out the way they play the "Full Up" rhythm on the the cover of Michigan and Smiley's "Thank You Jah" (see below). The rhythm section, esp. Bob Zohn's guitar, is just absolutely perfect. Jack Blackett murders the opening tenor solo, and they were off to the races. The combination singing between Zohn and Scott Korchak is great too. Steffens was definitely a big fan and advocate ... 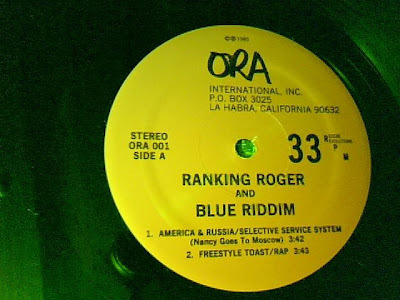 I also have a copy of one of Roger's shows from the night after Blue Riddim was in LA, and Johnny Osbourne jumped onstage and took the mic for several songs, and he (JO) couldn't stop talking about how good they were. Again, you can't beat that kind of validation. For more information about the band, you can visit their MySpace Web site. They are still performing shows around their hometown of Kansas City. 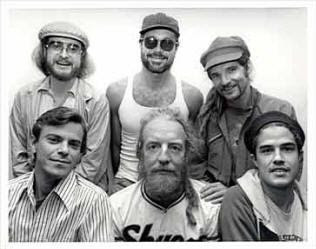 KCUR-FM public radio in Kansas City recently did a story on the history and impact of the band including an extensive interview with Duck McLane. Its definitely worth a listen. The band has also recently released a new CD titled 'Ska Inferno' which is available on CD Baby. Finally, below is a download link for the long out-of-print version of 'American & Russia/ Selective Service System (Nancy Goes To Moscow) featuring Ranking Roger. Have a listen to this piece of American reggae history. Thanks to Sonchey from Life In Monochrome for the link. I have it from a reliable source that Lister Hewan-Lowe, the noted reggae deejay, A&R man, and proprietor of the Clappers record label, used to rinse "Nancy Reagan" back in the day. This article is priceless. One of my favorite songs of all time. Also, not mentioned is the fact that Lister Hewan-Lowe played the HELL out of this song for YEARS on WBAI and WUSB in NYC and Long Island respectively - that's how most NY'ers heard it. Respects from Kansas City, MO. I listened to "Alive in Jamaica" over and over when I was about 15. One of my favorite bands from KC or anywhere. Thanks for a great article on one of my favourite bands ever! Keep up with the band on Facebook and Myspace, there is more to come! A freshly recorded album will be out soon on the Inate Sounds label. 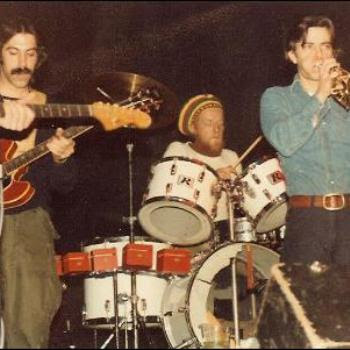 I saw BRB at a small reggae club in Scottsdale, AZ in the early 80s where they packed the tiny stage and blew the roof of the joint. Really an astonishing performance. Shared some reefer with a couple band members at break and had a nice chat. A great nite, I carry it in my heart, thank you Blue Riddim Band and thank you Marco for the article. I had never heard of the band until today. Great stuff. Many thanks for the enlightenment. So glad you have finally had a chance to hear Blue Riddim. You need to hear their live album to really appreciate how great a band they were. That song got heavy play here in Santa Cruz, CA from a demo cassette before the vinyl ep was even out! Different mix on the demo. The Rankin Roger remix really disappointed me at the time, as a fan of Roger and BRB. But since I dumped the record, I have a second chance to listen again! Thanks! Saw BRB in '82, and it's all true. One of the best EVER. Best Rankin Roger moment: him toasting over "Armagideon Time" with the Clash in concert. Also interviewed him in the General Public days. My brother Paul did that painting for the album cover. He still lives in Hollywood, CA and has a website called: ArtistPaulBedard.com if you would like to see more of his paintings. BRB was the truth. Great music, soulful people. I was there when they recorded at Channel One and it's a shame that the music was never released. Duck gave me the R&B mix tape of destiny after the sessions. I still have it! Glad to see they are back at it. Great music, soulful people. Everyone in JA who heard them respected them. BRB and Steel Pulse were the only non-Jamaican bands that Jamaican musicians universally agreed had it happening. I was there at the Channel One sessions and wondered what had ever become of them. Duck gave me a great R&B mix tape that I still have. I loved reading this. BRB was a real inspiration to me as a white kid learning to appreciate and eventually play reggae in the 80's. I went on to play in numerous bands for 20+ years and I always fondly recall listening to these guys! I even got to see them once in Washington, DC. It was probably 1984 or 85.